Christian Egalitarianism: All people are equal before God and in Christ; have equal responsibility to use their gifts and obey their calling to the glory of God; and are called to roles and ministries without regard to class, gender, or race. Partial Complementarianism: Men and women are different in both role and related authority in marriage, courtship, and in the polity of churches. We also affirm the paradoxical truths of mutual submission among Christians and of co-leadership of men/women, husbands/wives. Naturally, there has been a significant debate over which position is correct. One of the most thoughtful and wise theologians that I have come to trust over time is John Stott (1921 – 2011). His 2006 book Issues Facing Christians Today is surprisingly up to date and relevant, and I find his defense of partial complementarianism sensitive, comprehensive, and concise. And so in this post, I want to summarize his points for your consideration. Stott first covers the ways in which scripture affirms the equality of the sexes. Both man and woman are made in God’s image and both are given dominion over the earth and its creatures (Genesis 1:26-28). He affirms that the Bible attributes both masculine and feminine qualities to God (Dt. 32:18, Is. 42:14, Is. 49:15, Is. 66:13, Ps. 131:1, Lk. 15:8, Mt. 23:37). Second, he covers how equality was distorted by the fall into sin. In some real sense, women would be in subjection to men, who would “rule over” them. Stott points out that this was not meant to legitimize patriarchal abuse, and when Israel was godly and healthy, women were loved, cherished, protected, and honored for both their wisdom, industry, and ability to manage business affairs (Prov. 31). In addition, Joel promised that in the new covenant, God would pour out his spirit on all people without regard for gender (Joel 2). Third, Stott records the many ways in which Jesus lifted and honored women in his ministry. He covers the choosing of Mary the mother of Jesus, the financial support by women of Jesus’ ministry, His acceptance and care for prostitutes, adulteresses, and his engagement with the Samaritan woman. And not least of all, Jesus’ cadre of female disciples. Equality of worth is not identity of role. Naturally, the answer to his question is “yes”. His first approach is to examine the pre-fall relationship of men and women in Genesis 1-2. In this yet untainted condition, were there not only complementary genders, but roles associated with those genders? He makes a useful distinction between Genesis 1 and Genesis 2 – that the former entails the relationship between humans and God, while the latter is about the relationship between man and woman. What is revealed in the second story of creation is that, although god made male and female equal, he also made them different. In Genesis 1 masculinity and femininity are related to God’s image, while in Genesis 2 they are related to each other, Eve being taken out of Adam and brought to him. Genesis 1 declares the equality of the sexes; Genesis 2 clarifies that “equality” means not “identity” but “complementarity”. It is this “equal but different” state which we find hard to preserve. Yet they are not incompatible; they belong to each other as essential aspects of biblical revelation. Stott is not unaware that, at this point, egalitarians are uneasy, if not objecting. He repeats his claim that arriving at the right calculus for harmonizing equality and complementarity is difficult, but necessary lest we slide down the slope to androgyny and emasculation of men. He asserts that when we do so, even secularists will arise to affirm the value of the differences between the genders, as seen in the popularity of John Gray’s Men are from Mars, Women are from Venus, and as seen in the success of Promiser Keepers. Paul was culture bound (this passage is not for today) – like Paul’s edict for slaves to “obey your masters,” Paul’s commands for women were only relevant within the regressive, patriarchal and slave society of Rome. Headship means “source” not “authority” – this is the most popular approach among my egalitarian friends, and proposes that headship is not about authority, but the source of life. “Headship” clearly seems to imply some kind of “authority” to which “submission” is appropriate, as when “God placed all things under his (Christ’s) feet and appointed him to be head over everything for the Church” (Eph. 1:22). But we must be careful not to overpress this. It is true that the same requirement of “submission” is made of wives to husbands, children to parents, slaves to masters, and citizens to state. There must, therefore, be a common denominator between these attitudes. Yet I cannot believe that anyone conceives the wife’s submission to her husband to be identical with obedience expected of children, slaves, or citizens. With regard to the comparison to slavery, he mentions one stark difference in Paul’s approach, further undermining the idea that like submission in slavery, submission in marriage is now obviated in Christ (though this falls mostly under the cultural relevance argument). While egalitarians can claim that submission and other male/female relational passages have both one way and two way application, the exclusivity of the one way arguments above, and the absence of direct commands for husbands to submit to wives argues against the egalitarian view, and for a harmonizing position. …The resolute desire of women to know, be and develop themselves, and to use their gifts in the service of the world, is so obviously God’s will for them that to deny or frustrate it is an extremely serious oppression. It is a woman’s basic right and responsibility to discover herself, her identity, and her vocation. The fundamental question is, in what relationship with men will women find and be themselves? Certainly not in a subordination that implies inferiority to men and engenders low self-esteem. Only the biblical ideal of headship, which because it is selflessly loving may justly be called “Christlike”, can convince them that it will facilitate, not destroy, their true identity. 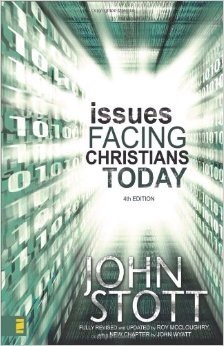 Team Context – Stott argues that all New Testament ministry should be done in the safety of plural pastoral oversight. However, in this context, headship means that the norm to be striven for is a male team leader, even if current circumstances demand or are limted to female leadership. In addition, Stott singles out the case of biblical discipline, which involves the wielding of authority. Humble Style – While a humble approach ought to be the norm for any preacher or teacher, preaching can involve authoritative delivery and moral challenge which, if delivered by a woman to a man, may have the proscribed effect of exercising authority over men. But this is the reality we should be seeking, namely a ministry characterized by humility not authority. For men it will mean expressing their God-appointed headship in self-sacrificial service. For women, it will mean submitting to his headship and not attempting to discard or assert it. Then men will remain men, and women women, and an unbiblical confusion will be avoided…. I know of and am reading more sophisticated and longer works (Payne, Fee) on this subject, but as usual, Stott’s coverage is fairly comprehensive, yet concise, and a great starting point.